Hola family and welcome to a tangy Sour Patch Kids scented edition of Panama’s number one weekly source for Panama hats (which is actually Costa Rica, ironically), The Sunday Brunch – We are the linguistic expression corresponding to an inference of one particular to another particular where at least one of the premises or the conclusion is general…or something like that. 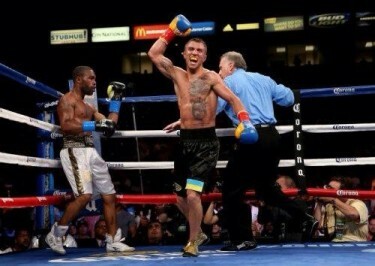 This week we’re touching on Vasyl Lomachenko’s big win over Gary Russell Saturday night. Also on tap, Robert Guerrero’s entertaining victory over Japan’s Yoshihiro Kamegai…And we take a good long look at Devon Alexander’s big head and examine why Bad Chad Dawson is so fat now. With that being said, I gave you your instructions in the dressing room, what I say you must obey – Cuidate, escucha me, toca los manos y buena suerte…Let’s get it on! If you saw the 1980s classic GhostBusters, you’re very familiar with the term “crossing the streams”. Golden Boy Promotions and Top Rank did the boxing equivalent of crossing the streams last night when two high-profile amature fighters with wildly divergent professional experiences met to fight it out for the vacant WBO featherweight title. Vasyl Lomachenko, the two-time Olympic gold medalist proved why he was placed on the (extreme) fast track to superstardom by largely dominating the Al Haymon/Golden Boy fighter Mr. Gary Russell Junior. 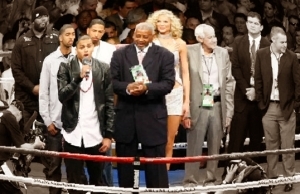 While many have said that Russell was over-protected in his rise to 24 professional victories, there have been those that claimed that he was being moved along at a safe and steady clip. I’d argue that perhaps the D.C. native would have been better prepared to deal with Lomachenko had his competition been a bit stiffer. As is the case with many Haymon managed fighters, though, often times their path to big paydays are filled with too many “soft touches”. Whether or not this was the case, Vasyl Lomachenko dominated large stretches of the fight and proved to be the superior boxer Saturday evening. The final Showtime Punch Stats had Lomachenko throwing a total of 209 less punches, but landing 100 more…leaving Russell Jr. with a final connect percentage of just 10%. On paper, this was a very hard fight to pick. Gary Russell had the faster hands and combinations, while Lomachenko possessed better offense and more power. Russell was the crisper counterpuncher while the Ukrainian had better defense and perhaps better ring generalship. In all honesty, if you’re 24-0 you don’t want to lose to a 1-1 fighter. Coming into this bout Vasyl Lomachenko was far from just a 1-1 boxer, though. 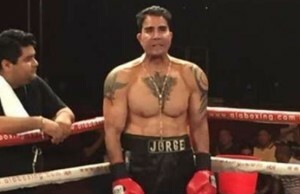 His amatuer record is almost unbelievable, with an insane record of 396-1, redeeming his only loss two times over (this puts him in the rare league of amazing talents such as Guillermo Rigondeaux). Lomachenko also was awarded the coveted Val Barker Trophy for most outstanding fighter at the Beijing Olympic games. Despite the defeat, Gary Russell is still an excellent boxer and has a myriad of national awards to his credit. Russell has the ability to defeat most in and around his division and will be back to likely claim a title in the near future. In what turned out to be a better than expected, clever bit of matchmaking, Robert Guerrero returned to the ring after more than a year hiatus following his dismantling at the hands of Floyd Mayweather last May to face Japan’s largely unheralded Yoshihiro Kamegai. Initially I suspected that man from Sapporo, Japan was carefully selected to be an easy walk-over for the Gilroy garlic festival goer, Guerrero – and maybe he was – however, after a couple of frames where he looked susceptible to a big stoppage, Yoshihiro Kamegai showed true grit and managed to give as good as he got (if not better in some instances) and banged it out with the Ghost for all 12 of the scheduled rounds. In the sixth, Kamegai was able to blind Guerrero by administering a a clean right uppercut that resulted in a nasty gash and a gigantic swelling of the left eyelid. After the bout Robert Guerrero stated that he just wanted to give the fans what they wanted…While that is a noble statement and he and Kamegai did give the fans what they craved, I contend that Guerrero knows no other mode of boxing – The phone booth style of combat he’s usually engaged in is the only type of fighting he ever does; luckily he found a dance partner who was willing to participate (and/or had a very similar style). “Bad” (?) 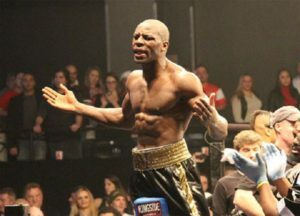 Chad Dawson returned to collect an embarrassingly low purse for himself against the hapless George Blades, who happily folded it in at the first sign of adversity. Dawson earned 15 thousand dollars, but had to forfeit $3,000 for coming in four pounds over the limit…for a grand total of nearly 204 pounds on fight night! His tattoos are stretching out nicely, though. A 45 minute montage of Robert Guerrero worshiping the “Crossfit” gods is a bit too much. 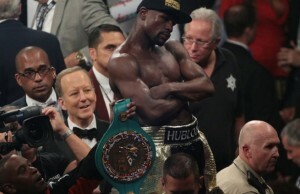 Speaking about that, they actually found a hat big enough to fit on Devon Alexander’s gigantic dome. I’ll be damned. That’s it for this week, team. Join us next time when we’ll be discussing the Yuriorkis Gamboa – Terrence Crawford fight, we’ll also have step-by-step instructions on how to break down a fish and a wild boar. If you have a way with Photoshop and are able to fuse Devon Alexander’s head with that of the H.R. Giegr Alien head don’t hesitate to email me at JESSEBOXINGTRIBUNE@GMAIL.COM or pretend we’re friends on Twitter @JESSEBOXING … Until next time, sante!